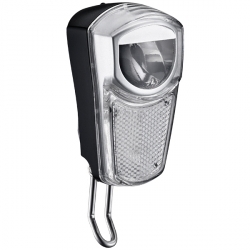 The Union / Marwi / Hilux UN-4268 offers a very bright (35 Lux) light, with a good pattern due to the shaped reflector for a very competitive price. All these lights have a manual on/off switch for use with a hub dynamo (when used with a bottle dynamo simply leave the switch in the on position) and there is also the option of automatic switching based on ambient light levels and standlight (light remains on after you stop), still at a very good price. Supplied with a bracket for mounting to the fork and cable long enough to reach to a front mounted dynamo. Connectors provided on the back of the light are also switched automatically and are intended for connection of a rear light. See our detailed instructions for setting up dynamos. This headlight offers the best price / performance currently available.